In this third stand-along novel in the Uncharted series, Keith’s marooned but making the best of it culture at long last has time to invest in events not directly tied to survival—reading for knowledge and pleasure, finishing a library building, developing new material to read, perhaps a way to share news and information. The year is 1868, seven years after Landing. Five and a half years earlier, Hannah Vestal promised her dying mother to put the family first. The oldest in a family which includes two brothers and three sisters, Hannah’s time is controlled by running a busy household. The villagers have sorted themselves into their mutual trades, so each family isn’t responsible for self-sustenance. Hannah makes candles which she can trade for things like paper on which to write her story. Since losing her mother’s encouragement, Hannah shares her story with her friend, the village teacher, Olivia. Olivia helps her find the strength to complete her story and have it printed. Meanwhile, the printer, Henry Roberts, has exchanged his birthright farming with his younger brother Simon who is more suited to caring for the animals and crops. Their father, who ran the printing press, invested Henry with the press, but Henry had been hurt years earlier while helping build the family barn. Now, with pain in both damaged hand and pride, and two unsuccessful passing love interests behind, he decides bachelorhood is his fate. His almost obsessive-compulsive need for order and realism doesn’t translate to the finest of courtly personalities, and when Hannah, courage screwed on, approaches him for a book publishing deal, his business-like response causes both of them to review their lifestyle choices. With the aid of loving family and friends, Hannah and Henry meet their challenges and come out stronger on the other side. Keith ends this story with a lovely tie-in to the contemporary Uncharted series. 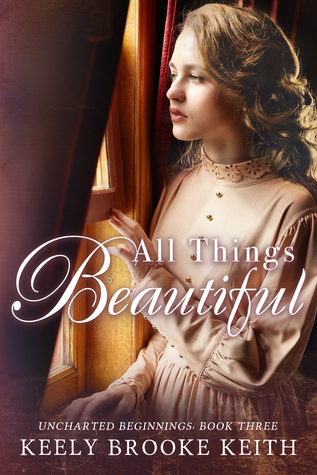 Told through alternating perspectives, All Things Beautiful is a revelation of what matters in life. The story is an exploration of the depth of heart and soul and the willingness to see and grown beyond our capabilities. Well-done. Recommended for those who enjoy historical drama with a faint twist of unusual circumstances. This is a stand-alone story with good set-up of the situation, so readers can jump in anywhere and enjoy any story of The Uncharted stories. 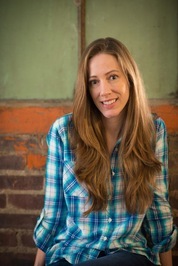 Keely Brooke Keith writes inspirational frontier-style fiction with a twist, including The Land Uncharted (Shelf Unbound Notable Romance 2015) and Aboard Providence (2017 INSPY Awards Longlist). Keely also creates resources for writers such as The Writer’s Book Launch Guide and The Writer’s Character Journal. Born in St. Joseph, Missouri, Keely grew up in a family that frequently relocated. By graduation, she lived in 8 states and attended 14 schools. When she isn’t writing, Keely enjoys playing bass guitar, preparing homeschool lessons, and collecting antique textbooks. Keely, her husband, and their daughter live on a hilltop south of Nashville, Tennessee.